The community of Piney Creek is master planned to include approximately 1,850 homes. In addition, land has been set aside for commercial development, an elementary school, and nearly 60 acres of public open space. Together, these uses provide for a balanced community where people play, live, and work in a setting rich with historical interest. In order for Piney Creek to function as an integrated community both now and in the future, several governmental and quasi-governmental entities have been established to ensure the development and maintenance of community systems. 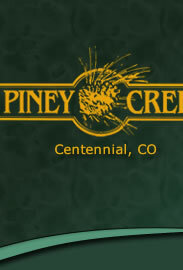 Those entities include the Piney Creek Metropolitan District, which provides for collector street and storm sewer construction; the Arapahoe Park and Recreation District, which builds and maintains parks in the area; the Piney Creek Maintenance Association, which is responsible for the maintenance of certain common areas within Piney Creek; and the Piney Creek Recreational Association, which operates and maintains the Piney Creek recreational facilities.